Supreme Court Justice Frank Nervo sitting in a divorce part in New York County recently had before him a case where a wife brought an application to modify or set aside a separation agreement she had entered into with her husband. She wanted the court to rescind the portion of the separation agreement the parties had entered into which dealt with the transfer of the parties’ marital home. She claimed she was not able to carry out her financial obligations under the separation agreement. The reason for her inability to fulfill her obligations was she could not obtain financing needed to pay a distributive award to the husband. She argued in her pleadings that if she was unable to make the payment he did not have to transfer the marital residence to her. She claimed the wording of the separation agreement was a mistake, and she was defrauded. The terms of the separation agreement were therefore impossible for her to carry out. Judge Nervo did not see it that way. He dismissed wife’s lawsuit. He found her allegations of a mutual mistake could not be proven. The only mistake was made by her. He also found there were no fraudulent misrepresentations. Judge Nervo ruled the wife’s claim that it was an impossibility for her to perform the terms of the separation agreement regarding the payment to the husband for the house were not proven. The husband’s application to dismiss her complaint was granted. 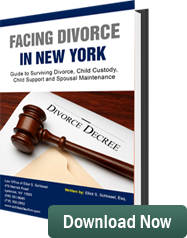 Elliot S. Schlissel and his associates are father’s rights attorneys representing fathers throughout the Metropolitan New York area in divorces and family court cases. His law firm has been helping fathers with legal issues involving child custody, child support and visitation problems for more than three decades.